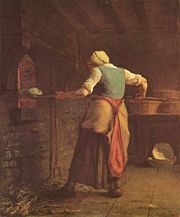 Oven depicted in a painting by Millet. An oven is an enclosed chamber designed for heating, baking, or drying. Over the course of history, various types of ovens have been used for cooking. Some high-temperature ovens, known as kilns, are used to make ceramic products. Industrial ovens are used for a variety of applications, including chemical processing, food production, and electronics. By 3200 B.C.E., settlements across the Indus Valley Civilization had an oven within each mud-brick house. Proper front-loaded bread ovens originated in ancient Greece, and culinary historians credit the Greeks for developing bread-baking into an art. The Greeks created a wide variety of doughs, loaf shapes, and styles of serving bread with other foods. Baking developed as a trade and profession, as bread was increasingly prepared outside of the family home by specially trained workers to be sold to the public. This is one of the oldest forms of professional food processing. The Greeks also pioneered sweetbreads, fritters, puddings, cheesecakes, pastries, and even wedding cakes. Often prepared in symbolic shapes, these products were originally served during special occasions and ceremonies. By 300 C.E., the Greeks had developed over 70 different types of bread. There are various types of ovens, some of which are noted below. Convection oven (fan oven, turbo oven): In a convection oven, a traditional oven is augmented by circulating hot air using a fan. Food warms faster in a convection oven because the moving air strips away the thin layer of air that otherwise surrounds and insulates the food. Technically, all ovens have natural convection currents, so it would be more accurate to use the term "forced-convection oven." Dutch oven: A Dutch oven is a thick-walled, iron (usually cast iron) cooking pot with a tight-fitting lid. A camping (or cowboy or chuckwagon) Dutch oven is typically made of bare cast iron and has three legs, a wire bale handle, and a slightly convex, rimmed lid so that coals from the cooking fire can be placed on top as well as below the pot. This provides more uniform internal heat and lets the inside act as an oven. Modern Dutch ovens designed for use on the cooktop or in a regular oven are typically smooth-bottomed and may be made of aluminum or ceramic. Earth oven (cooking pit): An earth oven is a simple, long-used cooking structure. At its simplest, it is a pit in the ground used to trap heat and bake or steam food. 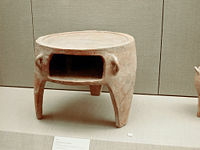 Earth ovens have been used in many places and cultures in the past, and the presence of such cooking pits is a key sign of human settlement often sought by archaeologists. They remain a common tool for cooking large quantities of food in places where no equipment is available. Industrial oven: Industrial ovens are heated chambers used for a variety of industrial applications, including drying, curing, or baking components or products. They are available in various sizes and configurations and can be used at different temperature ranges, but usually not at the extremely high temperatures of a kiln or furnace. They are used by many industries, including those involved in chemical processing, food production, and electronics. Kiln: A kiln is a thermally insulated chamber in which controlled, high-temperature regimes are produced. They are used to harden, burn, or dry materials, including wood (to produce firewood or charcoal), glass (for annealing or fusing glass, or fusing metallic oxide paints on its surface), clay (to produce ceramics), and ores (to extract metals). In the case of ceramic kilns, a shaped object is the final result, while cement kilns produce a material called clinker that is crushed to make the final cement product. Certain types of drying ovens used in food manufacture, especially those used in malting, are also called kilns. Masonry oven (brick oven): This type of oven consists of a baking chamber made of fireproof brick, concrete, stone, or clay. Though traditionally wood-fired, coal-fired ovens were common in the nineteenth century, and modern masonry ovens are often fired with natural gas or electricity. Modern masonry ovens are closely associated with artisanal bread and pizza, but in the past they were used for most types of baking. Microwave oven: A microwave oven (or microwave) is a kitchen appliance that employs microwave radiation primarily to cook or heat food. The microwaves, which are almost always emitted from a magnetron, (excite water (primarily)) and other polarized molecules within the food to be heated. This excitation is fairly uniform, leading to food being heated everywhere all at once, a feature not seen in any heating technique. The inside of a modern kitchen oven. In cooking, the conventional oven is a kitchen appliance. Food normally cooked in this manner includes meat, casseroles, bread, cake, and various desserts. In the past, cooking ovens were fueled by wood or coal. Modern ovens are fueled by gas or electricity. When an oven is contained in a complete stove, the burners on the top of the stove may use fuel that is the same as or different from the fuel used by the oven. Ovens have been designed for a variety of methods for cooking. A common method is to heat the oven from below, as when using the appliance for baking and roasting. The oven may also be able to heat from the top, to provide broiling. To provide faster cooking with evenly distributed heat, convection ovens use a small fan to blow hot air around the cooking chamber. An oven may also provide an integrated rotisserie. Steam ovens introduce water (in the form of steam) into the cooking chamber. This can aid the formation of a crisp crust on baked goods and prevent the drying-out of fish and casseroles. The degree of humidity is usually selectable among at least several steps. Some steam ovens use water carried to the oven by the user in a container; others are permanently connected to the plumbing pipes. Some modern ovens can combine thermal and microwave cooking. This feature can greatly speed the cooking of certain types of food while maintaining the traditional characteristics of oven cooking such as browning. Ovens vary in the way they are controlled. The simplest ovens may not have any controls at all; several ovens simply run continuously at various temperatures. More conventional ovens have a simple thermostat that turns the oven on and off to maintain a pre-selected temperature. At the highest setting, the thermostat may also enable the broiler element. In addition, a timer may allow the oven to be turned on and off automatically, at pre-set times. More sophisticated ovens may have complex, computer-based controls, allowing a wide variety of operating modes and special features, including the use of a temperature probe to automatically shut the oven off when the food is completely cooked to the desired degree. Orthodox Jews may purchase ovens whose controls include a sabbath mode automation feature. Some ovens are built with various aids to cleaning. Continuous cleaning ovens have the oven chamber coated with a catalytic surface that helps break down (oxidize) food splatters and spills over time. Self cleaning ovens use pyrolytic decomposition (extreme heat) to oxidize dirt. Steam ovens may provide a wet-soak cycle to loosen dirt, allowing easier manual removal. In the absence of any special methods, chemical oven cleaners are sometimes used or just old-fashioned scrubbing. Autoclave: An autoclave is an oven-like apparatus with features similar to a pressure cooker. It can heat aqueous solutions to temperatures above the boiling point of water, to sterilize the contents of the autoclave. Furnace: A furnace is used to heat a building or melt materials such as glass or metal for further processing. A blast furnace is a particular type of furnace generally associated with metal smelting (especially steel manufacture). It uses refined coke or similar hot-burning fuel, with pressurized air pumped in to increase the temperature of the fire. ↑ History of the Indus Civilization Retrieved June 30, 2008. How do self-cleaning ovens work? HowStuffWorks. This page was last modified on 8 January 2019, at 21:13.